Asked to say what Greek Government requests Finance Minister Siluanov is considering, the ministry spokesman said today – nothing. 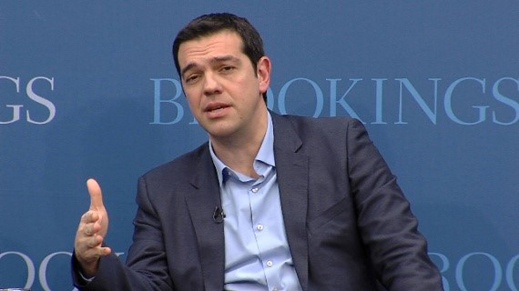 That’s to say, the Greeks haven’t proposed a Plan B, and if they do, the Russian response will be — nothing. The Russian reason – the new Greek Government, like its predecessors, is regarded by the Kremlin as a US client, engaged in secret dealings with Washington which would put a Russian loan, if it were extended, at risk of being wasted, or lost. Asked whether a Moscow loan in Plan B has been tabled, the new Greek Ambassador in Moscow, Danai-Magdalini Koumanakou, said through a spokesman that she would consider her answer, and decide when to give one. Koumanakou presented her credentials to President Vladimir Putin four months ago, on October 23. She is still considering what to say. At the start of 1949, when the Politburo was discussing what assistance to provide the Greeks, the country had already recorded a loss of more than 100% of its GDP caused by the invasions of the Italian and German armies. The civil war, triggered by British forces in December 1944 and funded on the Greek Government side by the UK and US, halted the post-war recovery of Greece, so that it lagged far behind the recovery of the countries which had been occupied during the world war; and also behind the enemy states, Italy and Germany. The one sector of the Greek economy to benefit until 1950 was the military, police, and security agencies. Altogether, they received $400 million from Washington; that’s equivalent to $4.4 billion today. A recent econometric calculation indicates that the annual loss of Greece’s GDP growth, counting destruction of livestock and non-agricultural capital, unemployment, casualties and displacement of population during the civil war was 12.15% per year until the war ended in August 1949. The GDP loss in Greece since the start of the German-directed EU bailout programme has been about 30%; that’s an annual rate of almost 6% or about half the loss rate inflicted by the German invasion or by the civil war. The casualty rate – dead and wounded – is less today; the displacement rate – from village to city or emigration – almost the same. Russian strategic analysts do not agree that Greece is as important as Tsipras claims, nor as stable. Alexei Pushkov, chairman of the Duma Committee on Foreign Affairs, said he refuses to discuss Greece. Sergei Karaganov, head of the Council for Foreign and Defense Policy, prefers discrete silence. Yury Kvashnin, head of the EU studies section at the Institute of World Economy and International Relations in Moscow, says the new Greek government is pretending to approach Moscow in order to play at “blackmail” with the EU. 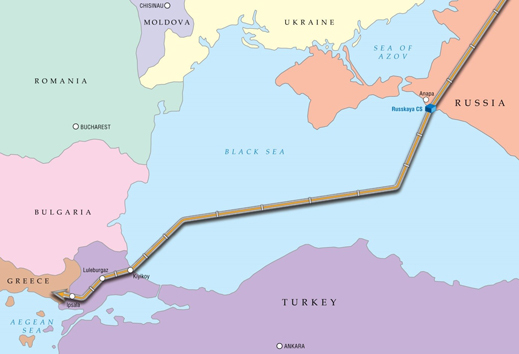 The source also noted that early this month Gazprom chief executive Alexei Miller (below, right) toured western Turkey with Turkish Energy Minister Taner Yildiz (left) and discussed the route of Turkish Stream, the renamed South Stream pipeline project which was cancelled after EU pressure last December. Moscow analysts of Greece dismiss claims published in US and UK media that there is an influential relationship between Ministers Kotsias and Kammenos and Konstantin Malofeev (below, left), the financier of Orthodox causes and the Novorussian resistance to Kiev, and Malofeev’s ideologist, Alexander Dugin (right). US Government radio, the Financial Times, and Der Zeit have reported this month: “Powerful Russians want to drive a wedge into the EU and are fighting for Moscow’s dominance. Confidential emails reveal how they are influencing the Greek government.” Malofeev and Dugin are the “powerful Russians”, Kotsias and Kammenos the influential figures in the Greek government.